Hi there, forex buddies! From time to time, Pip Diddy and I bring up the CME Group’s Fedwatch Tool to show the likelihood of a rate hike from the Fed. Recent examples of such times include my review of the August NFP report and Pip Diddy’s Top Forex Market Movers of the Week for the trading week ending on September 16, 2016. And if you’ve ever wondered what those charts and numbers mean, and maybe you want to learn how to interpret them yourself, then today’s little primer will help you out. The CME Group’s Fedwatch Tool calculates the unconditional probability that the Fed would hike, cut, or keep the federal funds rate steady during a given FOMC meeting. These calculations are based on the CME Group’s 30-Day Federal Funds Futures. And the Federal Funds Futures, in turn, are instruments that allow market players to hedge against (or profit through speculation on) changes in monetary policy. Given the purpose of the Federal Funds Futures, it naturally follows that buying and selling activities on these instruments are a reflection on what the market thinks the Fed will do in the future. Know the Fed’s target range for the federal funds rate. Know when the next FOMC meeting would be. You can check out the Fed’s official website here for that. Look at the current price of the relevant 30-Day Federal Funds Futures (FFF) contract. You can find it here. If the difference is greater than the upper limit of the Fed’s target range, then the market is leaning more towards a rate hike. But if the difference is less, then the market expects that the Fed would hold steady (or even cut). Let’s use the December meeting as an example, shall we? The Fed decided to keep its monetary policy during the September FOMC statement. The target range for the federal funds rate therefore remains at 1/4 to 1/2 percent (0.25% – 0.50%). Clicking on the link I provided earlier, we can see that the next FOMC meeting is on November 2. However, we are using the December 14 FOMC meeting as an example, so let’s go with that. As of September 28, 2:31 am CT (7:31 am GMT), a December 2016 fed funds futures contract was priced at 99.53. The difference is 0.47, so the implied average federal funds rate is 0.47%. This is obviously lower than 0.50%, which is the upper limit of the Fed’s target range. Therefore, the market is not expecting that there would be a December rate hike. The FedWatch Tool uses a more complicated model than the simple math that we used above in order to print out the unconditional probabilities of a given outcome. We don’t really need to get into that since the CME Group already does that for us, but you can see the CME Group’s methodology here, if you really want to. By the way, you can find the CME Group’s FedWatch Tool here. And if you clicked the link to the FedWatch Tool, you’ll arrive at a page that looks like the screencap below. And as highlighted above, the FedWatch Tool has a table which lists the target rate, the current probability, and the previous day’s probability. The target rate refers to the Fed’s target range for the federal funds rate. And as discussed earlier, the Fed’s target range is currently at 0.25% to 0.50%. A 25 bps rate hike would therefore raise the target range to 0.50% to 0.75%. Looking at the screencap again, we can see that as of September 27, 11:15 pm CT, the current probability for the target rate of 25-50 is at 91.7% while the current probability of a target rate of 50-75 is at 8.3%. This means that the market has priced in a 91.7% probability that the Fed will keep the federal funds rate on hold during the November FOMC meeting while the probability of a rate hike is only 8.3%. 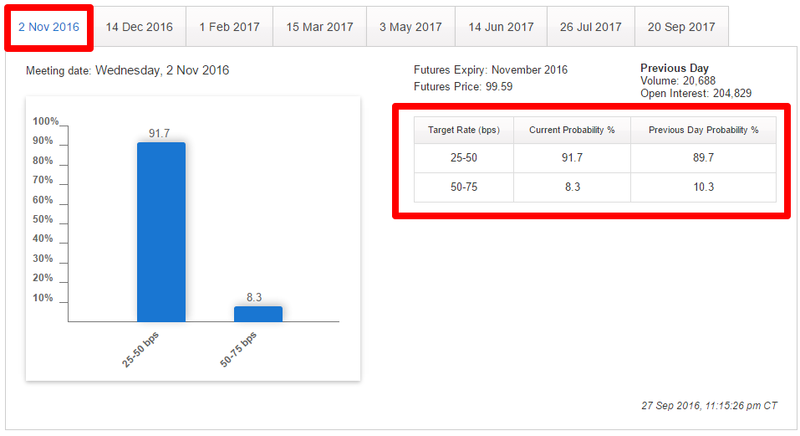 The FedWatch Tool is therefore saying that market participants think that a November rate hike is very highly unlikely. Simple enough, right? But take a look at what the FedWatch Tool has to say for the December 14 FOMC meeting below. How do we interpret that? Looking at the current probability for the target rate of 25-50, we can see that there’s a 52.4% probability that the federal funds rate will be kept at the 0.25% to 0.50% target range. But what about the other two? Well, like the earlier example, the 50-75 target rate implies a 25 bps rate hike. Meanwhile, the 75-100 target rate implies two 25 bps rate hikes, with one in November and then another in December. 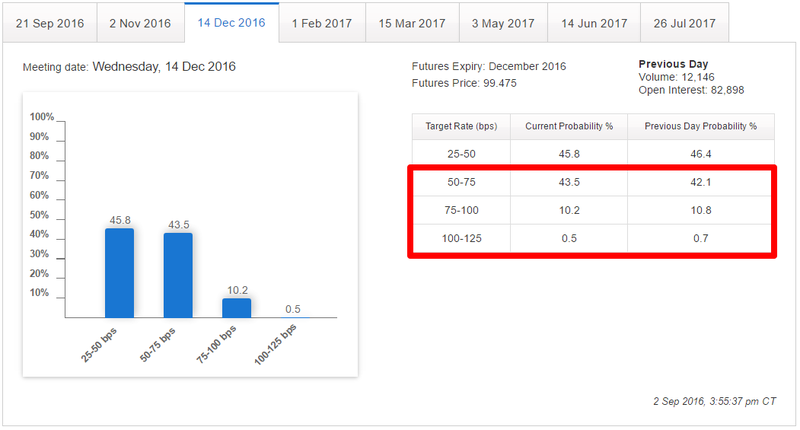 And looking at their probabilities, there’s a 44.1% probability that the target rate would be at 50-75 by December while there is a 3.6% probability that the target rate would be at 75-100 by December. Both scenarios obviously require a rate hike to raise the target rate. And you add them up to get a 47.7% probability that there would be a December rate hike. 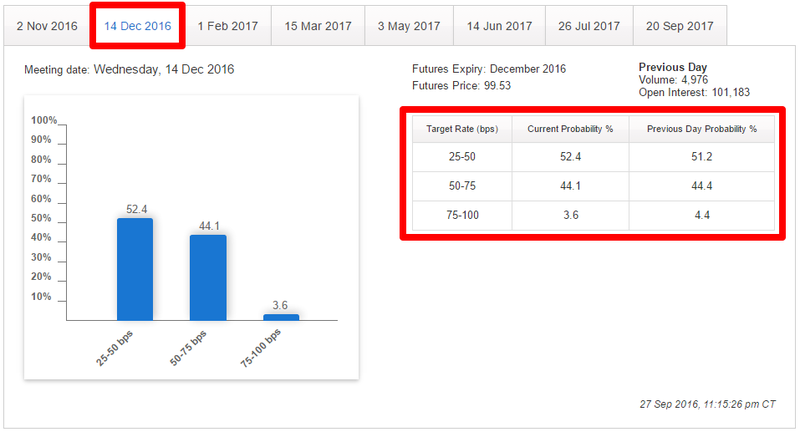 In short, the FedWatch Tool is saying that compared to the November FOMC meeting, there’s a higher chance for a rate hike in December. However, odds are still in favor of the Fed standing pat yet again. The FedWatch Tool is a useful tool for gauging the odds of a rate hike (or rate cut) ahead of an FOMC statement. However, keep in mind that the FedWatch Tool is based on the 30-Day Federal Funds Futures, which are frequently traded instruments that react to catalysts that could affect the Fed’s decision making process. The FedWatch Tool is therefore also useful in putting economic reports in perspective, relative to rate hike expectations. One good example of using the FedWatch Tool to make sense of an economic report would be the market’s reaction to the August NFP report. As I noted in my review, non-farm employment only increased by 151K, which is below the 180K consensus. And as a result, the Greenback weakened across the board. However, the Greenback was later bought back up, which seemed very mysterious. But based on the FedWatch Tool, the NFP report actually strengthened the odds of a December rate hike from 53.6% to 54.2%, which helps to explain the Greenback’s later strength. So there you have it! Hopefully, this little primer was enough to help you understand what the CME Group’s FedWatch Tool is all about, as well as how to interpret it and use it to make sense of economic reports relative to rate hike expectations.